Bolton Wanderers have signed Barnsley striker Craig Davies for an undisclosed fee that is believed to be £300,000. The 26-year-old, who has signed a two-and-a-half-year deal, has scored nine goals in 23 games this season including four in the 5-0 win against Birmingham. 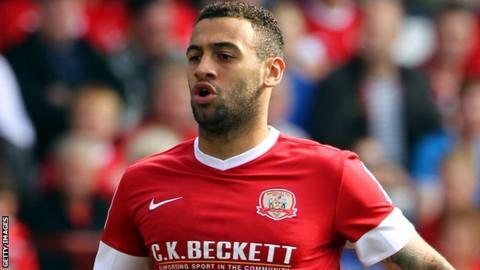 The ex-Manchester City trainee moved to Oakwell from Chesterfield and has spent time at Oxford, Oldham and Brighton. Davies, who has six caps for Wales, is Dougie Freedman's first permanent signing since he took charge. He has played in Italy with Verona and had loan spells in England with Wolves, Stockport, Yeovil and Port Vale. It is understood that Davies had a £300,000 release clause in his contract, enabling Bolton to talk to the front man. Speaking after Saturday's FA Cup draw against Sunderland, Bolton manager Freedman told BBC Radio Manchester: "He's someone with the right experience and potential that I want to bring to the football club. He's got experience of the division and he's hungry." He told the club website: "Craig is a player I am really fond of. I actually tried to sign him a couple of years ago and he will bring all the right ingredients to our club. "He is hungry. He hasn't got the T-shirt of playing in the Premier League, but is desperate to get it. He's a good age and represents very good value for the football club. "He is the type of player I want around the place."